The James River cuts its way through the Blue Ridge and across the Virginia Piedmont to eventually empty into the Chesapeake Bay. Here along its middle reaches, this mighty river is flanked by towering sycamores and rolling pastures. Wildlife abounds along its banks with pileated woodpeckers’ raucous cries echoing from the deeper woods and furtive common yellowthroats singing from its weedy edges. 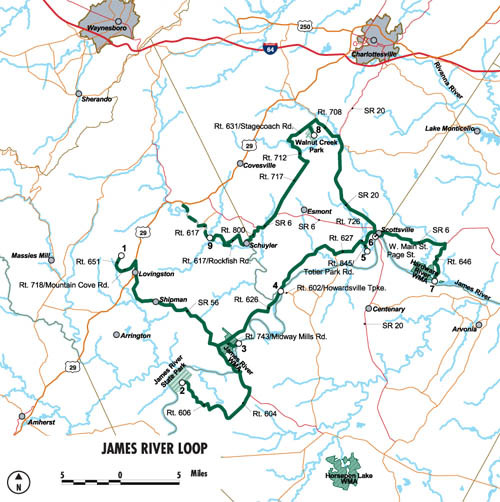 The James River Loop will introduce visitors to an assortment of wildlife management areas, as well as, the forested wilderness areas of Fortune’s Cove. This loop, perhaps more than any other in the Piedmont, gives a sense of wilderness and untouched natural beauty increasingly hard to find elsewhere.